Omar Bartov, a Jewish scholar born and raised in Israel, gathers, through various written and oral narratives, the violent history of Buczacz (pronounced and spelled Buchach in Ukrainian), a Polish/Ukrainian region where the author’s family lived before migrating to Palestine in 1935. “The conversations with my mother,” says Bartov, “made me want to learn more about my ancestors—how they lived and how they died.” The book, however, that Bartov has written is not a family chronicle but an insightful anatomy of the 20th century European psychosis. Some regions, such as the Buczacz district, now located in Ukraine, receive historical attention because interethnic rivalries and superpower conflicts permeating the region generate microscopic brutalities of huge proportions. Composed of shifting populations of Poles, Ukrainians, and Jews, the Buczacz region has been for centuries trampled over by conquerors, colonizers, and settlers, much like Jerusalem. Superb storytellers, like Bartov and Shmuel Yosef Agnon (a Nobel Prize laureate), deepen the historical significance of towns and narratives that might otherwise be forgotten. In the 13th century, Buczacz is a fiefdom founded by Polish aristocratic families. However, the region has never been exclusively Polish as other ethnic populations, particularly the Ukrainians, proud of their own culture and language, claimed it to be their ancestral homeland. Jews had lived in Poland for centuries. In the 17th century, the Jews of Poland “constitute the single largest Jewish population in the world.” Yet for economic and religious reasons, the Jews refuse to dissolve their separate identity in Polish nationalism. Much like the Ukrainians, the Jews, after having lived there for generations, remain a separate people in Poland, including the Buczacz district. Ethnicity triumphs over nationality. Yet the Buczacz Jews, with their ancestral roots in Poland, identify more with the Poles than Ukrainians, even though both Slavic communities treat them as unwanted aliens (much like the Romas in Western Europe). In 1699, the Buczacz Jewish community receives incentives and favorable laws from local Polish rulers to promote commerce and trade in the region. Rabbinical courts are established. In 1728, “a massive stone” synagogue is built in the city. In Agnon’s words: “As long as Buczacz existed, prayer in it never ceased.” By the 1920s, Jews constitute the majority of the Buczacz town (60% of 12,000). Jews are prosperous, they live in stone houses, and they dominate the politics of Buczacz. When Jews are forced to live in ghettos, they are despised as unwanted aliens. When Jews are free and affluent, they are despised as heartless manipulators. This much is vivid in Bartov’s narratives. No community in the Buczacz district has any sustainable respect for the local Jews. In hard times and war times, the neighbors view the Jews as untrustworthy exploiters of commerce, hoarding wealth, manipulating the system, snitching—and, therefore, worthy of the massacre. This is anti-Semitism, says Bartov. Converging on the German occupation of the Buczacz district, Chapter Six of the book collects the holocaust stories of the Jewish families sandwiched between the two Slavic communities, Poles and Ukrainians, themselves locked in acrimony. The perpetrators of most atrocities in the Buczacz district are the Germans. Poles are deported. Jews are deported and killed. With Jewish men disappearing, Jewish women serve as maids in the German military and civilian households. Under the Nazi occupation, the dynamics of the Buczacz district change the sociology and once friendly neighbors turn into murderous enemies. However, the Germans, looking for “living space” in the East, have no interest in a free Ukrainian state. They are willing to hand over the Eastern parts of the territory to the Soviet Union. The Poles and Jews detest the invading Germans. And yet the Poles and Jews are poles apart as Poles do not trust the Jews, and Jews do not trust anyone. While the Nazis are cultivating hatred in Germany and the Russians are consolidating communism in the Soviet Union, the Buczacz Jews are vociferously supporting the Zionist movement for the establishment of Israel. The fear of the Nazis invading Poland compel many Buczacz Jews to migrate to Palestine and New York. In both places, the local Jewish organizations have prepared to receive the immigrants from Buczacz. An eerie coordination is taking shape. The Germans, Poles, and Ukrainians do not want the Jews to stay in Europe and Jews are fostering the Zionist movement for self-exile to establish “in Palestine a national home for the Jewish people.” Ironically, however, “the more prominent Zionist activists in Buczacz did not emigrate” to Palestine. In March 1944, the Red Army arrives in the Buczacz district. The local Jews prefer the Soviet Union over Nazi Germany because the existential threat from Hitler is manifest. Furthermore, the Soviet communism, an ideology fathered by a fellow Jew, Karl Marx, seems genial, idealistic, and promising. Some Poles feel that the Jews have betrayed them by participating “in the Soviet victimization of the Poles.” Each ethnic group perceives the Soviet intervention differently. However, the Poles accuse the communist-Jews of deadly collusions with the Soviets. The “local Jews . . . walked around and pointed at people” for the Red Army to arrest and deport Poles and others. The book’s narrative is not a binary rendering of black and white, Jew versus non-Jew, good against evil. Even though the book catalogues in detail the sorrowful Jewish woes caused by the Poles, Ukrainians, and Germans, its deeper theme excavates complex dynamics of predictable community conduct blended with unexpected individual behavior. In times of extreme uncertainty, Bartov shows with the help of painful accounts, communities break down into unpredictable individuals. During the Nazi occupation, individuals from the Ukrainian community show unexpected brutality and random kindness to persecuted Jewish families. And Jews, including Jewish children, align with the killers to save their own lives. Jewish police officers turn into informers against the local Jews, but they also constitute a resistance force in the forest, a few miles away from the city. Bartov demonstrates that a catastrophic event, such as wiping out a target community, does not occur abruptly. Prejudice simmers slowly, gathering more and more poison over time. Suspicion, hostility, false stereotyping, and intergenerational negativity aimed at a target community, such as the Jews in Buczacz, all come together over time to whet the minds and weapons for the perpetration of a genocide. Bartov’s book is a significant contribution to the holocaust literature. However, the book’s contribution is even more significant in understanding the complexity of interethnic conflicts, made worse through superpower interventions, driven by real and presumed betrayals, contending notions of freedom, territorial aspirations, relativity of good and evil occupying the minds of conflicting communities, shifting interethnic alliances, yearning for shared identity, and breakdown of the community solidarity under extreme circumstances. 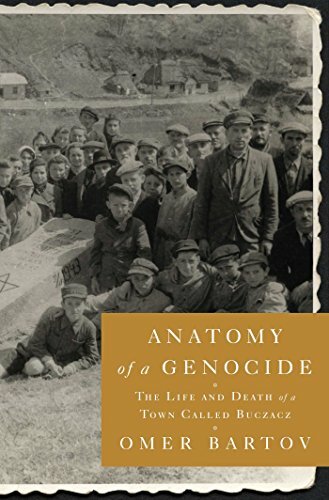 Anatomy of a Genocide furnishes well-lit imagination, though shaded with sadness, beneficial for the communities trapped into mutual impairment in various parts of the world, including Chechnya, Palestine, Kashmir, Burundi, and Rwanda.